I hate theatre. Well, it's so disappointing, isn't it? You know what I do when I'm sitting in a darkened theatre waiting for the curtain to rise? I pray. Dear God, please let it be a good show. And let it be short, oh Lord in heaven, please. Two hours is fine, three is too much. And keep the actors out of the audience. God. I didn't pay a hundred dollars to have the fourth wall come crashing down around my ears. I just want a story, and a few good songs that will take me away. I just want to be entertained. I mean, isn't that what it's all about? Amen. 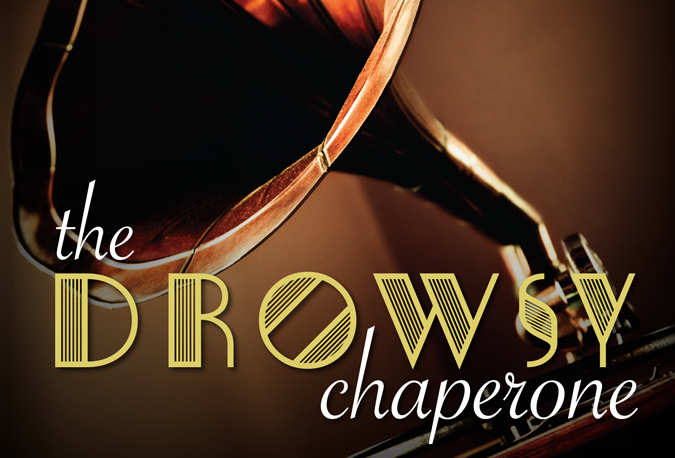 So goes the opening monologue of the 2006 Broadway musical homage to musicals, The Drowsy Chaperone. This monologue is delivered by a man in sitting in a chair on the side of the stage, identified only as "man in chair." I pretty much am man in chair. Obviously I don't hate theater (and I don't spell it theatre), but I do sit in a darkened theater and hope to be entertained (but only for two hours or so), and to be taken away by a story and a few good songs. Of course not all musicals are escapist entertainment, but even when the subject matter is heavier (e.g., Next to Normal or Spring Awakening), or even when there's no music at all (we call that a play), all I want is to escape into the world of the show and experience something new, or familiar, or surprising, or comforting. 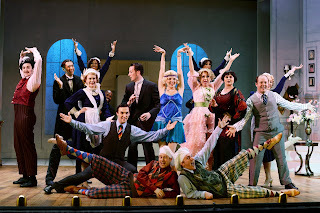 The Drowsy Chaperone is the ultimate musical for people who love musicals (and all their flaws), and Artistry's perfectly delightful production delivers on all I hope for sitting in that darkened theater - a story, a few good songs, just about two hours, no actors in the audience, and truly wonderful entertainment. Artistry's production is all-around gorgeous, beginning with their man in chair, Tod Petersen. He's effortlessly charming even when the man is complaining about this or that. In fact I'd like to listen to every Broadway cast album with Tod as he explains it to me and points out his favorite parts. It really feels like we're experiencing this with him; watching him watch the show is a big part of the fun. Yet at the end when man in chair joins in on the show, the expression of something beyond joy on Tod's face brought tears to my eyes. The entire ensemble is fantastic, as per usual at Artistry. 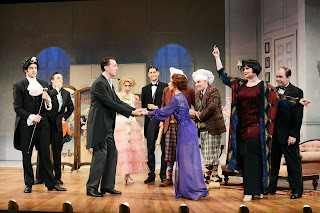 C. Ryan Shipley is perfectly cast as the groom Robert, with his early 20th century matinee idol looks, tapping skills, and wide-eyed guileless white-toothed smile. Angela Steele (who continues to remind me of Cristin Milioti) is also perfectly cast as showgirl-turned-bride Janet who "doesn't want to show off no more," with beautifully exaggerated dramatic arm movements. Other highlights include Gregory Adam as the smarmy Broadway producer, Berit Bassinger, spot-on in her portrayal of the stereotypical ditsy blond, and Brittany Parker as the big-voiced boozy drowsy chaperone. Director/Choreographer Michael Matthew Ferrell has given us some dynamic and busy dance numbers which the cast performs with great energy and precision. 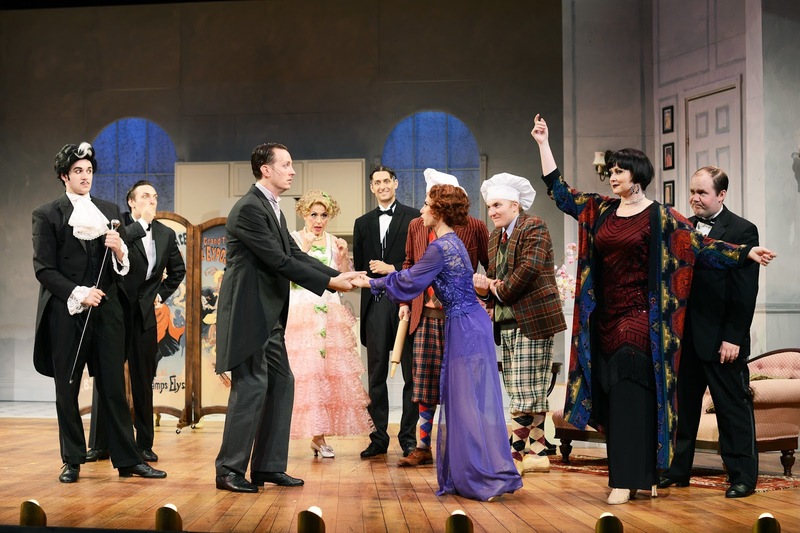 Ed Gleeman's costumes are '20s-glamorous, and the apartment set (designed by Curtis Phillips) looks so homey I'd love to spend an afternoon there (listening to cast albums of course), with just enough set pieces brought in to bring the musical scenes to life. And last but not least, Anita Ruth's pit orchestra sounds gorgeous as always on these relatively new but classic sounding musical theater songs, complete with an Overture! About The Drowsy Chaperone, man in chair says, "It does what a musical is supposed to do. It takes you to another world, and it gives you a little tune to carry with you in your head for when you're feeling blue, ya know?" Yes, yes I do know, man in chair. That's precisely why I do this, and why I love shows like The Drowsy Chaperone that fulfill the expectant promise of a darkened theater. You, too, can experience that joy through September 11 at Artistry in Bloomington. *Plot summary borrowed from what I wrote about Mounds View Community Theater's delightful production last month.